It’s late, you’re safely tucked away in bed… you hear a noise. Is the house settling? The cat looking for a treat? An uninvited critter in the kitchen?… or something more sinister? These are the types of things that can keep you up at night and a good ghost story can have the same effect. Fells Point Corner Theatre’s (in collaboration with The Collaborative Theatre Co.) latest offering, the World Premiere of The Quickening by Mark Scharf, Directed by Ann Turiano, gives us an original ghost story that, with a few jump-scares and cleverly placed effects, will not only raise your pulse and possibly keep you up at night, but also make you think about what happens when we close our eyes for the last time. As stated, The Quickening, is a good old-fashioned ghost story set in present day. The story revolves around Beth, a young pregnant woman in a new neighborhood in a new town who knows the new house she lives in is more than meets the eye. She befriends her neighbor, Philomena (better known as Phil), a logical thinker with an open mind. Matt, Beth’s husband is a Civil War reenactor (a confederate soldier, no less), who believes most of the trouble has to do with Beth’s “condition” and how it effects the way she thinks. Meanwhile, Rosemary, Beth’s mother has come to help prepare for the baby and reveals a family secret that explains some of the strange goings on at the new house. Along with this explanation and a little research by Phil, the real story of the home unfolds with frightening conclusions that makes us question life, death, and the afterlife, if one believes it so. Cassandra Dutt’s Set Design is phenomenal and uses the space wisely. Her use of levels to present different rooms and locations is wise and her attention to detail is top-notch. 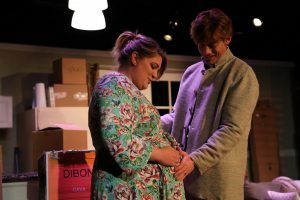 The Fells Point Corner Theatre stage is an intimate space but, with such a natural, authentic design, Dutt has managed to bring us into the living space of this young family which makes the audience feel closer to the action, adding to the experience. Technical aspects for a horror story or ghost story on stage can be tricky and teeter on the line of corny but, working in tandem with Set Design, I’d be amiss not to mention that the Lighting Design by Tabetha White and Sound Design by Devyn Deguzman which is absolutely stellar giving life to this story. White sets the scenes and changes moods with her sometimes subtle, sometimes drastic change in lighting to invoke both calmness and a frenzy with lighting effects. Deguzman, too, adds value to this production with the “bumps in the night” sounds and disembodied voices that go hand-in-hand with ghost stories and would fall flat without them. Both White and Deguzman are to be applauded for their work on this piece. Ann Turiano, who is no stranger to the stage, on or off, takes the helm of this production and her Direction is exceptional. 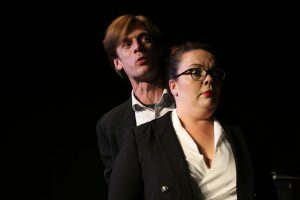 Bringing a brand new piece to the stage can be a daunting task, but Turiano seems to have taken it in stride with a clear-cut vision and great comprehension of the material. Her handling of this new work is impressive in both staging and overall concept. It’s a modern setting with an intricate story but Turiano has given us a polished, well-presented production that shows and tell the audience a story simply without the bells and whistles but with just the right amount of effects and concentrating more on character and dialogue. It’s also worth saying her casting is on point for this piece. Kudos to Turiano for a job well done. 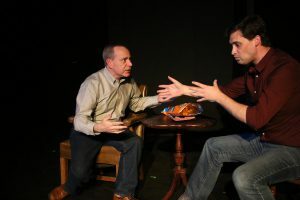 Award winning Baltimore playwright Mark Scharf has crafted a lovely story that is more about questioning faith, life, and death rather than a simple horror story. The scares are there and the creepiness factor is definitely apparent throughout, but his dialogue is well-thought out and well-researched. A few obligatory mentions of Baltimore seem a bit out of place, but there are only a few and do not hinder the production from moving forward. His in depth explanation of theories of physics and Catholic dogma are on point and actually teach a few things. The script did feel rushed at times – for instance, I would have preferred the realization and acceptance of what was going on in the house to be a little more gradual. It’s as if the characters simply accept the strange goings on with a few objects moving on their own and a strange little boy lurking about. However, that being said, I completely understand, for the sake of time, things need to be cut and the action still moved along smoothly and the story was told completely. Overall, this is an outstanding showing and I’m looking forward to seeing more of Scharf’s work in the future. Moving on to the performance aspect of this production, we are treated to a strong, small ensemble who brings these characters to life with great authenticity and emotion making for beautiful performances all around. To begin, Mariane Gazzola Angelella takes on the role of Rosemary, the clairvoyant mother of Beth and Amanda Spellman tackles the multi-faceted role of Beth, the tortured and targeted occupant of the house. Angelella is perfectly suited for her role as Rosemary, a good ol’ Bawlmer girl, who desperately wants to help her daughter through a tough time. Angelella even produced a good Baltimore accent but those born and raised can easily pick up that it is not a natural accent, but… it’s a hard accent to crack so, all in all, she does a superb job. Her character work is notable, as well, and she seems to have a good grasp on Rosemary, keep the character consistent throughout exuding the emotion of a parent of a child who is hurting in one way or another. Along the same lines, Spellman is excellent as the Beth and plays her to the hilt. Her chemistry with her cast mates adds a realness and natural air to her performance and she, too, has a good comprehension of this character and trials. Though she sounded a bit scripted, at times, overall, she gives a strong, confident performance that is a joy to watch. 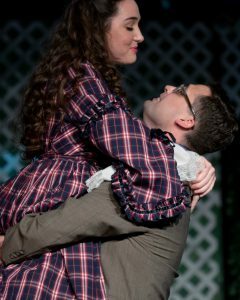 A highlight of this production is David Shoemaker as Matt Wells, the doting, logical husband of Beth (and completely outnumbered male). Shoemaker is no stranger to the stage and his natural abilities shine through in his gestures delivery of his dialogue, adding an absolute authenticity to the character. It’s clear he understands his character and his performance helps the audience understand him, as well. He is certainly one to watch in this production. 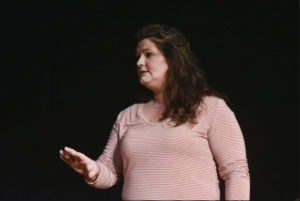 Last, but certainly not least, Debbie Bennett takes on the role of Philomena (Phil), the kindly neighbor who befriends and helps the family even though her logical side is conflicting with her faithful side and she is the standout in this particular production. This character is the most complex of all the characters because of this conflict and Bennett presents it superbly. Her delivery and portrayal of the character is sincere which adds to her performance. This character seems to be the bridge between the supernatural and the natural in this piece, putting a lot of responsibility on Bennet, but she carries it well and does not falter. I’m looking forward to seeing more performances from this actress. 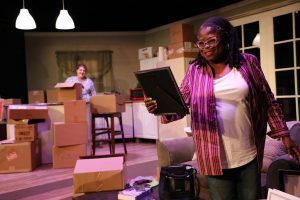 Final thought… The Quickening at Fells Point Corner Theatre is a scary (or horror) story that is presented in a very well put-together, well thought-out production. The script flows nicely, though at time seems a bit rushed, but overall, is a good story filled with intelligent, natural dialogue and diligent research. Be forewarned, there are a couple of jump scares but the effects are absolutely brilliant. The performances are admirable and the technical aspect is outstanding. Creating characters and bringing a piece to life for the first time can be difficult, but this team has done it beautifully. The entire cast, crew, and playwright are to be commended for their efforts and this is not a production you want miss this season. 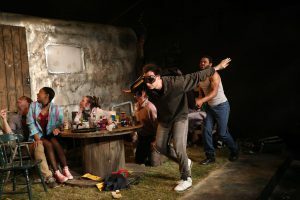 This is what I thought of Fells Point Corner Theatre and The Collaborative Theatre Co.’s production of The Quickening… What did you think? Please feel free to leave a comment! The Quickening will play through July 1 at Fells Point Corner Theatre, 251 S Ann Street, Baltimore, MD. For more information log on to fpct.org, or purchase tickets online. Religion is always a tricky and sometimes touchy subject in the arts, but that’s only when its taken too seriously. 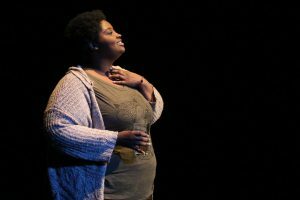 The latest offering from Fells Point Corner Theatre, the Baltimore Premiere of The Divine Sister, by Charles Busch finds a delightful balance. Directed by Steve Goldklang, with Set Design by Roy Steinman, Lighting Design by Charles Danforth III, Sound Design by Andrew Porter, and Costume Design by Anthony Lane Hinkle and Mary Bova (of A.T. Jones) this piece tickles the proverbial funny bone without offending and the story actually isn’t heavy on religion but sending a message of love, faith, and hope. Set Design by Roy Steinman is simple, yet detailed. Two moveable walls on wheels cleverly allow for various locations including an underground passageway, a courtyard garden, and a sitting room of an elegant mansion. Steinman’s design is traditional in the way that the scenes are definitely painted and not necessarily realistic, such as stained glass windows and a fireplace and mantel, but absolutely fitting for this production. Being a fan of traditional theatre and suspension of disbelief, I rather enjoyed the simplicity of the set. The entire set is designed to display stone work, as you would see in old churches and buildings and the stone painting is on point. Steinman uses his space very wisely, using the surprisingly large stage and breaking it up into sections with the moveable walls. The set pieces chosen are fitting and really separate the scenes and locations. Overall, the Steinman’s Set Design is appropriate and smart adding charm to the entire production. The scene changes are precise and careful, but often go on a few seconds too long. There are quite a few set pieces that have to make their way on and off stage between scenes and I’m sure the scene changes will cut their time as the production runs. Lighting Design by Charles Danforth III does more than light the actors on stage but sets the mood completely for each scene. Whether outside in a courtyard or in an underground tunnel, the lighting scheme matches the action and setting. Danforth’s design blends in with the action and is absolutely appropriate for the piece. To go along with Lighting Design, Andrew Porter’s Sound Design is on point for this production. Though there are not a lot of sound effects in this production, what is utilized is definitely befitting. Namely, the realistic “dripping water” sound effect used in the underground tunnel setting adds value to the scene and the production. The use of recordings is wise and is hilarious as the actors blatantly lip-sync through an entire number, skipping and dancing as they do. 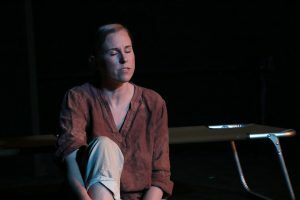 It’s worthe mentioning the song in the the courtyard between Mother Superior and Agnes is not only hilarious with the afore mentioned lip-syncing and skipping, but has beautiful vocals by actresses Holly Gibbs and Anne Shoemaker, with guitar by David Shoemaker. 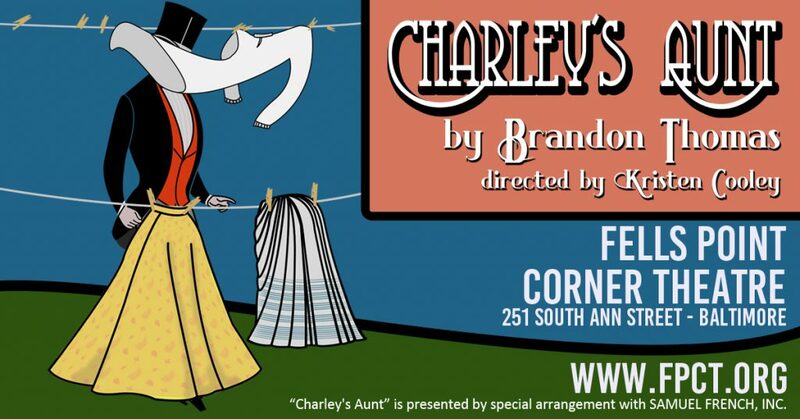 Costume Design by Anthony Lane Hinkle and Mary Bova (of A.T. Jones) is authentic and fun for this piece. Set in the mid 1960s, styles and fashion were flashy and all over the place, but Hinkle and Bova manage to capture the essence of the 60s with their Costume Design. The nuns, of course, are your traditionally dressed 1960s nuns with the full habit and rosarary and the actors seemed very comfortable in these genuine-looking habits, moving freely about the stage. Outside of the nun costumes, the “civilian” character costumes were equally as impressive. 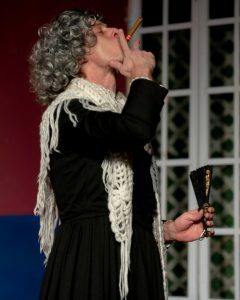 The many costumes of the character named Mrs. Levinson, were all on point and fitting of the character and time, with polyester looking material and vibrant colors of a wealthy middle-aged woman with a penchant and propensity for current fashion and haute couture. Kudos to Hinkle and Bova for their impeccable design. 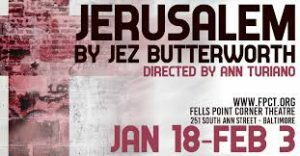 Steve Goldklang’s Direction of this piece is impressive and concise as his vision for this very funny and upbeat piece is clear making for a very well put-together production. Goldklang seems to understand this story is not merely making fun of any particular religion but using humor to tell a story and send an important message of trust and belief. y moving forward. Overall, Steven Goldklang does an outstanding job at the helm of this production. Moving on to the performance aspect of this piece, Kathryne Daniels as Sister Walburga/Mrs. Macduffie has a great look and command of the stage making both her characters interesting and entertaining. Her characters are completely different and Sister Walburga as the stern Sister from Berlin may not be all she seems while Mrs. Macduffie, the cleaning lady, seems to know everything that’s going on in their little circle and is happy to share her information. It seems Daniels is the only actor required to use accents for her characters (German for Sister Walburga and Scottish for Mrs. Macduffie) but she may have benefited by working with a dialect coach as her accents for both characters were a dicey, at best. Regardless, her performance was impressive and she seems to understand her characters and plays them beautifully. 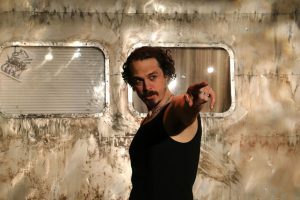 Tom Lodge as Brother Venerius/Jeremy is likable and carries the weight of being the only male character in the entire piece. 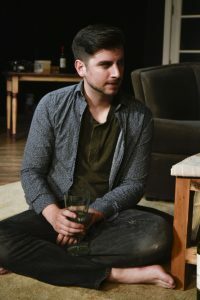 He is comfortable and confident onstage and his portrayal of Jeremy is believable and moves the story along through his dialogue, making him an involved character. However, for as good as he portrays Jeremy, his portrayal of Brother Venerius, whose face we never see, falls a little flat. Brother Venerius is a mysterious character lurking in the underbelly of the convent but I couldn’t pinpoint where is character is supposed to be from as the accent he chooses to use is all over the place and a little strange. Overall, Lodge gives a very strong performance and carries his characters quite well. Holly Gibbs is brilliant as Sister Acacius a.k.a. 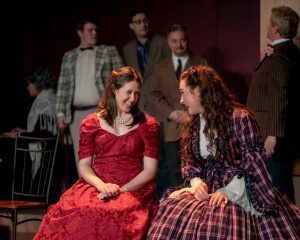 Lily in this production of The Divine Sister. She has great comedic timing and her understanding of the character is apparent as she pulls off the New York accent and mannerisms impeccably. As a nun who’s going through some things, including not necessarily wanting to be a nun anymore, and has an interesting past along with Mother Superior, Gibbs plays the role with the right amount of humor and is absolutely believable as Sister Acacius, the right hand man to Mother Superior. Gibbs never disappoints and her work in this production is no different. 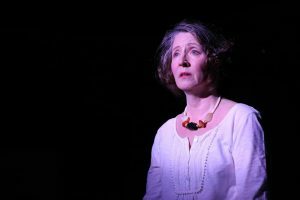 Anne Shoemaker as Agnes, the postulate who is having visions and healing the sick, is a standout in this production. Her comedic timing is on point and her character choices are impeccable. She plays this role with the perfect amount of “crazy” that is required for this character. A cross between Maria Von Trappe and Annie Wilkes (from Stephen King’s novel Misery), Shoemaker finds a perfect balance of innocence and insanity for this character and her depiction of the transition her character goes through is also admirable, In general, Shoemaker is confident and commanding and gives a strong and impressive performance. Lynda McClary as Mrs. Levinson/Timothy is hands down one of the highlights of this production. With that being said, in the role of Timothy, the young man who is bullied and not the best athlete, along with other adolescent issues, McClary is a bit much. An adult actor playing a child is always tricky and, for this production, McClary takes it to the extreme to being almost annoying, rather than funny, but, if anything, she is absolutely dedicated to the role, giving 100%. Her portrayal of Mrs. Levinson, however, is a completely different story. Mrs. Levinson is the wealthy, fashionable, and philanthropic widow who has secrets of her own and McClary pulls this role off flawlessly. With just the right balance of snootiness and humility, she is a riot with immaculate comedic timing and is an actress who isn’t afraid to make a fool of herself for the good of the production. She’s a seasoned actor and her confidence and command of the stage makes for a funny and outstanding performance. Last but certainly not least is Steven Shriner as Mother Superios a.k.a. Susan who is another absolute highlight of this production. For some reason, a man in drag is still funny after all the years of it being a bit in show business and this production is no different. Shriner is superb as Mother Superior and his delivery of the clever lines and his timing is just about perfect. The success of his performance is the character of Mother Superior seriously, not as a mockery, and it makes for a very strong, funny, natural performance. His soothing voice and mannerisms make for an authentic portrayal and a very likable character. As both Mother Superior and Susan, the young and sweet, but cut-throat New York reporter, Shriner gives a confident and commanding performance and I’m looking forward to seeing more from him. 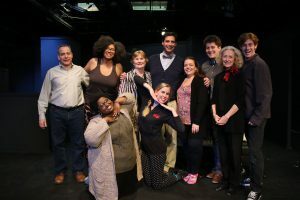 Final thought… The Divine Sister at Fells Point Corner Theatre is witty, hilarious show with a clever script and excellent performances from the ensemble. The piece pokes fun at religion but certainly does not mock it and, in the end, sends a good message of faith and hope through crafty humor that will have your sides splitting. Get your tickets now! You don’t want to miss this one! This is what I thought of Fells Point Corner Theatre’s production of The Divine Sister. What did you think? Please feel free to leave a comment! The Divine Sister will play through December 18 at Fells Point Corner Theatre, 251 S Ann Street, Baltimore, MD. For Tickets, go to fpct.org for information or purchase them online.